Hard times to be small. It has been a little hard lately with a couple of our bantams. 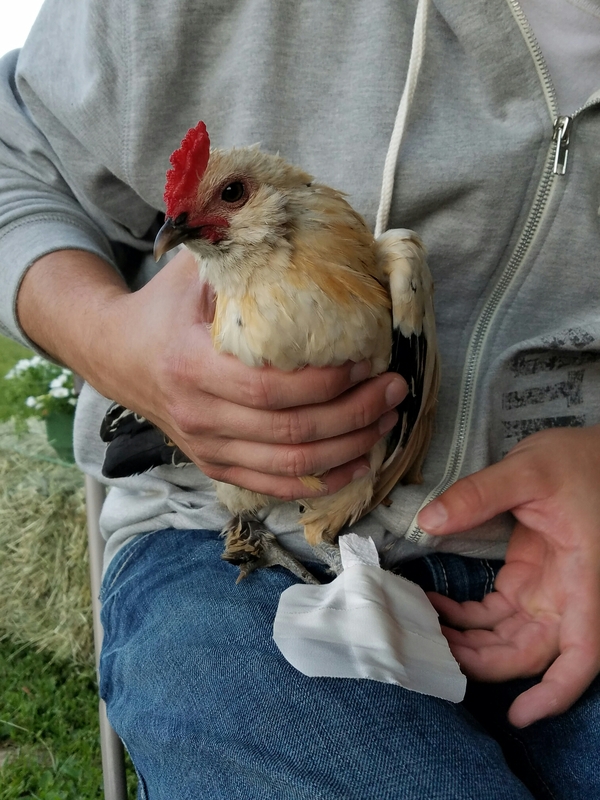 We have been on a roller coaster with our bantam rooster Loki with his foot. Recently, it has progressively gotten worse. We have moved him back to the house to restrict his movement but we are pretty sure his has lost blood circulation in his foot. Here is an old picture of us working on his foot back in July. The other sad news is I found my black bantam dead with only the carcass left in the field. Some THING ate it’s head and breast meat. I lock everyone up so it must have happened early morning. The neighbor also lost a hen a week ago. The other random thing is Autumn, our Americana has decided to hide her eggs. I haven’t seen a blue egg in over 2 weeks. We have looked all over the yard with no luck. I am about to either follow her or stick a camera on her. Here are some photos updates on the pigs and our haul from the hay auction- who have not been named.